PressAcademia Procedia publishes proceedings of conferences, seminars and symposiums. PressAcademia Procedia aims to provide a source for academic researchers, practitioners and policy makers in the areas of social and behavioral sciences and engineering. 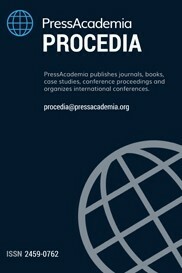 PressAcademia Procedia invites academic conferences for publishing their proceedings with a review of editorial board. Since PressAcademia Procedia is an open-access book, the manuscripts presented in the conferences can easily be reached by numerous researches. Hence, PressAcademia Procedia increases the value of your conference for your participants. PressAcademia Procedia provides an ISBN for each Conference Proceedings Book and a DOI number for each manuscripts published in this book.